Help us spread HOPE to our community! 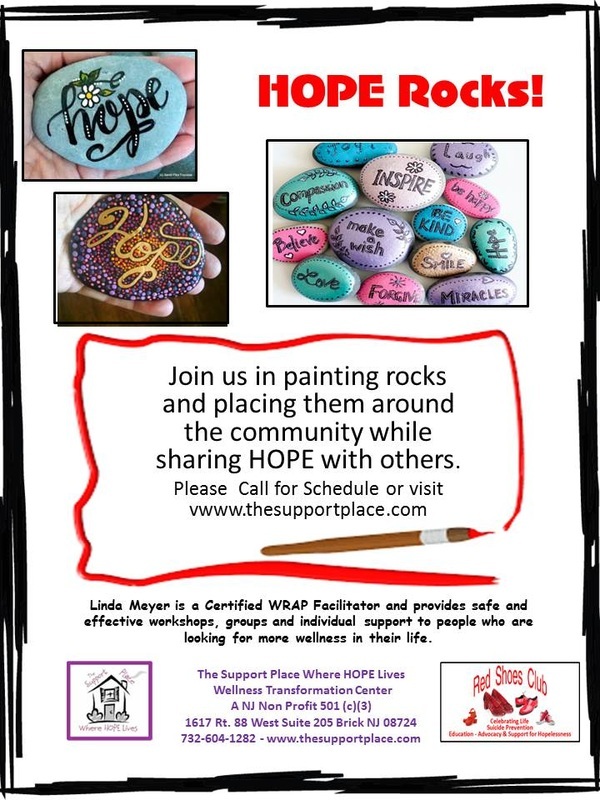 Join us as we have fun creating HOPE and positive sayings as we paint rocks and leave them around our community for others to find. Call 732-604-1282 for more information as we plan this fun project while we drink, have some snacks and meet new friends. Great for all ages! If you would like to create your own group, please let us know so we can give you a tag to place under your rock so people can find The Support Place Where HOPE Lives in case they are needing some support and looking for more HOPE. We will create and paint a positive saying on our rocks and place them around our community. When someone finds the rock, when they look under the rock there will be a tag to have them come to this page and either keep the rock or leave it for another person to find. This way anyone can join us in our rock parties or they may decide to join one of our groups or workshops. Either way there is nothing better than knowing other people care.